Crypto Asset Fund (CAF) is an open-end private fund launched in July 2017 with an objective to preserve capital while also achieving capital appreciation for U.S. and non-U.S. high net-worth individuals and institutional investors. * This objective is pursued, at varying levels of targeted capital appreciation and preservation depending on class and strategy, through the implementation of multiple investment strategies. These strategies relate to investments in tokenized securities, tokenized assets, certain cryptocurrencies (such as Bitcoin, Ethereum, and other present and future altcoins), securities tokens, utility tokens, “mining,” tethers and other digital or crypto assets. 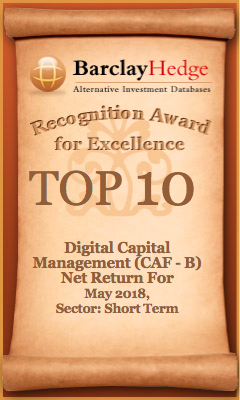 CAF may also pursue investments in early stage blockchain-enabled technology companies, as well as algorithmic trading and arbitrage. Class T (Trading): Class T actively trades digital assets seeking to maximize capital appreciation, with a secondary emphasis on capital preservation. Class T is denominated in US Dollars (“USD”). Class B (Bitcoin): Class B seeks to maximize capital preservation with a secondary emphasis on capital appreciation. Class B is denominated in Bitcoin (BTC) with performance measured in BTC. Class B may be an attractive strategy for long-term holders of Bitcoin. Class E (Ethereum): Class E seeks to balance capital appreciation and capital preservation. Class E is denominated in Ethereum (ETH) with performance measured in ETH. Class E may be an attractive strategy for those with a cache of Ethereum. * CAF generally offers monthly subscription and redemption opportunities, is structured as a master-feeder fund, and managed by Digital Capital Management, LLC. 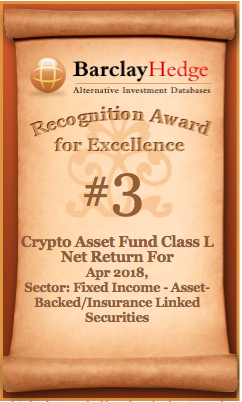 Crypto Asset Fund, LLC, a US fund, is the master fund and accepts investments primarily from US investors. Crypto Asset Fund (Cayman), Ltd., a Cayman Islands feeder fund, invests substantially all its assets in the US master and accepts investments primarily from non-US investors. Both the CAF US master and Cayman feeder offer the strategies and classes described above. 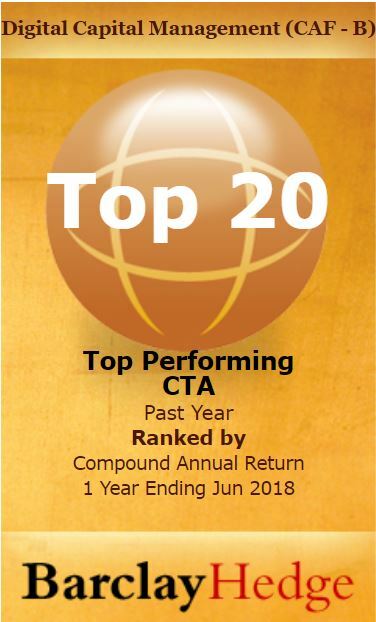 Awards and rankings do not represent any single investor’s experience and are not indicative of future investment performance. The awards and rankings above were compiled and published by Barclay Hedge, Ltd. (“BarclayHedge”) (www.barclayhedge.com/research/awards) based on estimated performance as reported to BarclayHedge by managers. 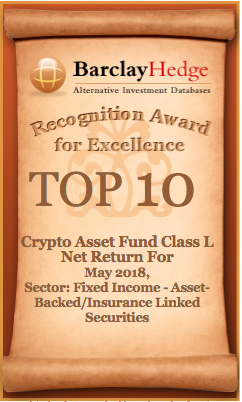 Managers that do not report performance to BarclayHedge are not represented in the awards and rankings. 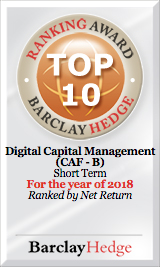 As the rankings are based upon estimates reported to BarclayHedge, when final performance is reported, it might not match the position awarded and the fund or manager could have moved up or down in the rankings. Digital Capital Management, LLC (DCM) is presently exempt from registration as a commodity trading advisor or “CTA”. 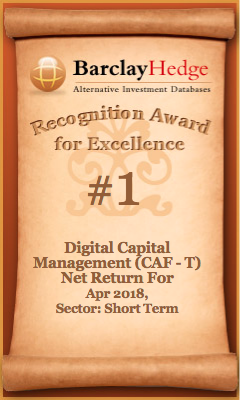 Awards reflected above for DCM, and granted for periods prior to October 1, 2018, relate to a predecessor manager which operated under substantially similar ownership and control. DCM was appointed as manager of CAF’s US master effective October 1, 2018, and of its Cayman feeder effective November 1, 2018. 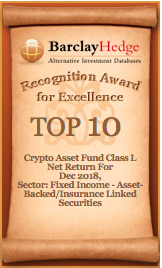 Subscribe To Our Mailing List To Download A Copy of The Latest Crypto Asset Fund Fact Sheet Now! THERE IS NO GUARANTEE THAT ANY INVESTMENT WILL ACHIEVE ITS OBJECTIVES, GENERATE PROFITS OR AVOID LOSSES, AND PAST PERFORMANCE IS NOT NECESSARILY INDICATIVE OF FUTURE RESULTS. INVESTMENTS IN CRYPTOCURRENCIES OR FUNDS PURSUING INVESTMENTS IN CRYPTOCURRENCIES AND RELATED ASSETS (“DIGITAL ASSETS”) ARE VERY SPECULATIVE AND CAN INVOLVE A HIGH DEGREE OF RISK. INVESTORS MUST HAVE THE FINANCIAL ABILITY, SOPHISTICATION, EXPERIENCE AND WILLINGNESS TO BEAR THE RISKS INHERENT WITH DIGITAL ASSETS, AND THE ABILITY TO WEATHER A POTENTIAL TOTAL LOSS OF THEIR INVESTMENT. DIGITAL ASSETS ARE NOT SUITABLE OR DESIRABLE INVESTMENTS FOR ALL INVESTORS. THIS FUND OVERVIEW PAGE DOES NOT CONSTITUTE AN OFFER TO SELL OR A SOLICITATION OF AN OFFER TO BUY, NOR WILL THERE BE ANY OFFER, SOLICITATION OR SALE OF THE INTERESTS, IN ANY JURISDICTION IN WHICH SUCH OFFER, SOLICITATION OR SALE IS NOT AUTHORIZED OR TO ANY PERSON TO WHOM IT IS UNLAWFUL TO MAKE ANY SUCH OFFER, SOLICITATION OR SALE. NO OFFER TO SELL OR A SOLICITATION OF AN OFFER TO BUY WILL BE MADE WITHOUT DELIVERY OF A CURRENT CONFIDENTIAL PRIVATE PLACEMENT MEMORANDUM. DIGITAL ASSETS RISK. The regulation of Digital Assets varies among countries, ranging from outright bans, to moderate or full regulation, to no regulation at all, and the global regulatory landscape for Digital Assets is in constant flux. Exchanges that trade Digital Assets have failed in the recent past, resulting in the complete loss of customer assets. Digital Assets are created, issued and transmitted according to protocols run by computers in digital networks, distributed ledger systems, blockchain ecosystems and similar technologies, all of which are subject to potential programming flaws, hidden errors, fraud and cyber-attacks. LIMITED LIQUIDITY. Withdrawals are permitted on only a monthly basis, subject to an advance written notice requirement, and may be suspended or only partially available. There is no secondary market for, or exchange trading of, fund interests, and they are non-transferable. These limitations may result in a potentially lengthy period before an investor is able to entirely withdraw interests, during which time the investor remains subject to all associated risks, including the risk of losing capital. Withdrawal proceeds may also be subject to reserves for contingent liabilities or be limited or delayed for other reasons. MANAGER RISK. The fund has a limited operations history and success is dependent upon the ability of DCM as manager of the fund to identify profitable investment opportunities, which is difficult, requires skill, and involves a significant degree of uncertainty. DCM has wide discretion to select strategies and investments without the approval of investors. Banks, exchanges and other financial intermediaries selected by DCM to trade for or provide services to the fund may encounter financial difficulties which could negatively impact the fund. There also exists the possibility of loss due to deviation from disclosed investment strategies, or simply poor judgment by the manager, or fraud by sponsors or promoters of Digital Assets or other fund investments. LACK OF DIVERSIFICATION. The fund has no established guidelines as to the diversification of its investment portfolio and it may from time to time be concentrated in a single or small number of Digital Assets or sectors within the market for Digital Assets. SUBSTANTIAL FEES AND EXPENSES. The fund is subject to substantial fees and expenses, which will reduce profitability and your returns, and include applicable management and incentive fees charged to each investor’s account with the fund. Performance-based incentive fees create an incentive for the manager to engage in riskier trading than it might otherwise pursue in the absence of an incentive fee. Each investor also pays a pro rata portion of the fund’s operating expenses, including expenses associated with formation, operations, legal, accounting, auditing, administration, clerical, marketing and the continuous offering of fund interests, and any extraordinary expenses. 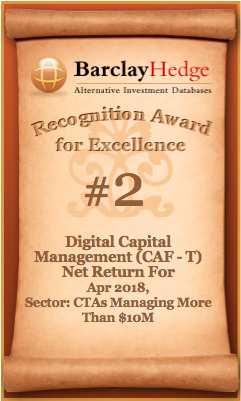 CAF(C), the Cayman feeder into CAF (the US master), is subject to an additional layer of expenses at the feeder fund level. Such additional expenses will further reduce performance of CAF(C) Classes T, B, and E from that for the same Classes T, B, and E of CAF. GLOBAL INVESTMENT RISK. The fund invests and trades across global markets with varying levels of regulation and investor protections. This presents risks not typically associated with funds that trade principally within a single jurisdiction, which may include adverse fluctuations in currency exchange rates, adverse political and social developments, less liquidity or greater volatility in certain markets, less developed or less efficient trading in certain markets, political instability and different auditing, legal and default or bankruptcy standards across global markets. LEVERAGE. The fund may be exposed to leverage through direct borrowing, or indirectly using derivatives such as options or swaps that have inherent or imbedded leverage. This will cause the fund to incur additional expenses, will magnify the fund’s potential gains or losses, and in turn increase the volatility of fund returns. COUNTERPARY AND CREDIT RISK. Investments by the fund in fixed income or debt instruments, or engagement in Digital Assets lending, expose it to credit risk, meaning the risk that issuers or counterparties to the fund’s investments or loans may default on obligations to the fund and cause potential losses. Any exposures to swaps or other derivatives, directly or indirectly, involve risks including leverage risk and counterparty default risk in the case of over the counter derivatives. Option positions held may expire worthless, exposing the fund to potentially significant losses. ABSENCE OF U.S. REGULATION. Interests in the fund are neither registered with the SEC nor with any State regulator, and the fund itself is not subject to SEC regulation as an investment company. Therefore, an investment in the Fund is not subject to the same registration and disclosure requirements and does not benefit from the same investor protection regulations, as are applicable to US mutual funds. The SEC has not passed upon the merits of or approved the interests in the fund, the terms of the offering of interests, or the accuracy of this presentation. TAX COMPLEXITY AND REPORTING DELAYS. The fund’s tax structure is complex, and investors should expect delays in receiving annual tax information and reports from the fund. Investors may be required to seek extensions of their deadline for filing annual income tax returns. There is no guarantee that any investment will achieve its objectives, generate profits or avoid losses, and past performance is not necessarily indicative of future results. Investments in digital currencies or funds pursuing investments in digital currencies and related assets (“digital assets”) are very speculative and can involve a high degree of risk. Investors must have the financial ability, sophistication, experience and willingness to bear the risks inherent with digital assets, and the ability to weather a potential total loss of their investment. Digital assets are not suitable or desirable investments for all investors. Digital assets may have limited operating histories, and the fees and expenses associated with funds pursuing investments in digital assets may be substantial. The information provided on this website is not intended to be, nor should it be construed or used as investment, tax or legal advice, a recommendation, or an offer or solicitation to buy or sell an interest in any crypto asset. Copyright © 2019 Digital Capital Management, LLC (doing business as DCM MGT, LLC in California). All rights reserved.